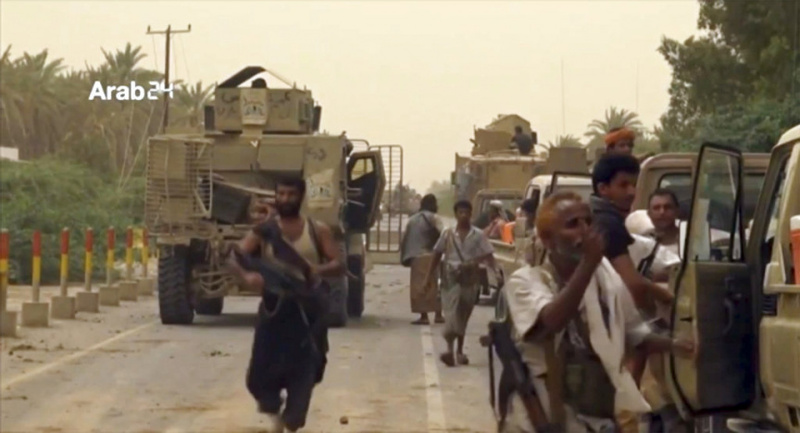 SANAA, Yemen (AP) — Fierce fighting raged Tuesday outside the airport of the vital Yemeni city of Hodeida, pitting thousands of pro-government fighters backed by a Saudi-led coalition against Iranian-backed Shiite Houthi rebels, Yemeni military officials said. The United Arab Emirates-backed Amaleqa brigades, supported by airstrikes and naval shelling from the Saudi-led coalition, have been trying to storm the southern and western parts of the airport, the officials said. However, land mines and Houthi snipers have been hindering efforts to get the airport under government control, they said. "It is a vast, open area and the Houthis have covered the ground with land mines to prevent the forces' advancements," one Yemeni military official said. "It's back and forth battles." The official said it was a matter of hours before the forces take full control of the airport. The Amaleqa brigades have captured dozens of rebel fighters, including minors, in the airport fighting, the officials added. Combat has been raging at the southern runway about one kilometer (less than a mile) from the main airport compound. Witnesses said warships and warplanes from the Saudi-led coalition have been hitting the airport and the east side of Hodeida around the clock since late Monday, aiming at cutting off the main road that links the port province and the capital, Sanaa. Government forces have been trying for days to capture the Kilo 16 road to trap the Houthi rebels inside Hodeida and the western coast and block supplies from coming in from Sanaa. Witnesses said fighting forced dozens of families to leave their homes in the area around the Kilo 16 road toward the countryside at the east side of Hodeida province. They said the rebels have fortified the area in preparation for a likely coming battle against government forces. Senior Houthi official Mohammed al-Bukaiti confirmed fierce fighting at the southern side of the Hodeida airport. "Battles are raging south of the airport under unprecedented air cover," he wrote on Facebook on Tuesday. More than 40 airstrikes from the Saudi-led coalition hit the airport in Hodeida since Tuesday morning, Houthi officials said. Witnesses say they have seen fire and thick smoke rising over the airport. The Houthi-run Al Masirah satellite news channel quoted an unknown military source as saying that heavy airstrikes have destroyed the infrastructure, the runway and the terminals of the airport. All officials spoke on condition of anonymity because they were not authorized to brief the media, which witnesses did so for fear for reprisals. Also on Tuesday, the Saudi-led coalition bombed a bus carrying civilians, killing six people on the outskirts of Hodeida, a senior Houthi-linked health official said. Yahia Sharaf Eddin said four of the dead were women and that the strike took place in the district of al-Gharasi. Witnesses however said that the coalition had targeted Houthi fighters, but that shrapnel also hit the bus that was carrying civilians. Earlier in the day, witnesses said another airstrike targeted a tractor driver and his assistant in eastern Hodeida. The driver was digging trenches for Houthi fighters, witnesses said. Both were killed. Meanwhile, United Nations special envoy for Yemen Martin Griffiths left the capital Sanaa after three days of talks with rebel leaders. He briefed the U.N. Security Council on Monday by video from Sanaa on his proposals to restart political negotiations to end the three-year conflict. Griffiths arrived in Yemen to try to avoid an all-out assault on Hodeida. The U.N. Office for the Coordination of Humanitarian Affairs said heavy fighting poses a danger to the warehouses used for humanitarian aid in the port city. In its daily report, UNOCHA heavy fighting has engulfed several districts outside of Hodeida, prompting relief agencies to relocate stocks away from the fighting, from which some warehouses are becoming inaccessible. The U.N. said on Monday that over 5,200 families have fled for their lives away from the fighting since June 1. The Saudi-led coalition began its attack on the Red Sea port town Wednesday. Emirati forces are leading ground forces mixed with their own troops, irregular militiamen and soldiers backing Yemen's exiled government. Saudi Arabia has provided air support, with targeting guidance and refueling coming from the U.S. The offensive has faced criticism from international aid groups, who fear a protracted fight could force a shutdown of the port and potentially tip millions into starvation. Some 70 percent of Yemen's food enters via the port, as well as the bulk of humanitarian aid and fuel supplies. Around two-thirds of the country's population of 27 million relies on aid and 8.4 million are already at risk of starving. The Houthis seized control of Sanaa in September 2014, later pushing south toward the port city of Aden. The Saudi-led coalition entered the conflict in March 2015 and has faced criticism for a campaign of airstrikes killing civilians and destroying hospitals and markets. The Houthis, meanwhile, have laid land mines killing and wounding civilians, targeted religious minorities and imprisoned opponents.